Locally grown, speciality cut flowers in the Shenandoah Valley. 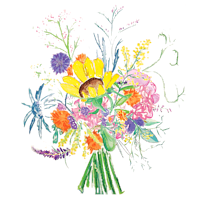 We are so proud to provide our own customers with an annual CSA option; And, we enthusiastically provide flowers as an add-ons for our vegetable grower friends, Project GROWS. Enjoy this personal & cost-effective option. Our 2019 CSA is open! The cost of a bouquet subscription is $60 per month. You can register for 1 month, 2 months or all 4 months! If you decide to register for the entire season (June - September), you will receive a discount = $225 for the entire season. Project GROWS is a non-profit farm located on 10 acres in the rolling hills of Augusta County, Virginia. We believe that all the world’s problems can be solved in a garden. Project Grows provides a vegetable CSA to local customers. They also provide add-ons such as Tiny Fields flowers, proteins from Polyface Farms, and milk products from Ballerino Creamery. Copyright 2018, Tiny Fields Farm.